David Langford’s personal fanthology of favourite pieces by other hands published in his own fanzines. First published April 1998 by Rune Press for Minicon 33 “in honour of Dave Langford, Fan Guest” in a splendid print edition designed and produced by Geri Sullivan, with cover art by Steve Stiles. Published as an Ansible Editions ebook for the TAFF site in June 2015, with the same Steve Stiles cover. 46,000 words. 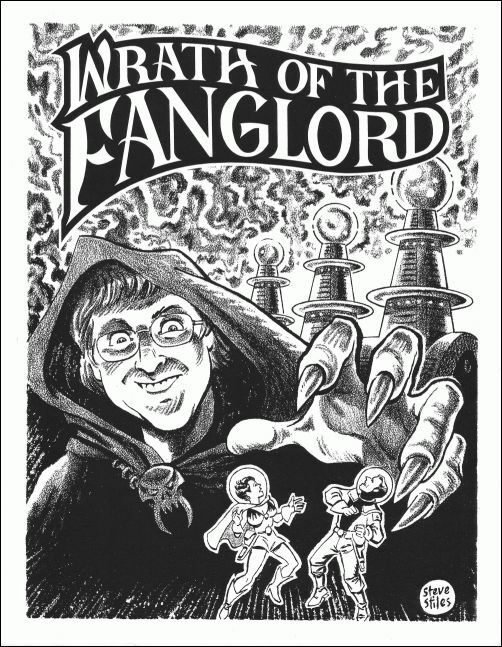 Contributors of prose, verse and artwork to Wrath of the Fanglord include Atom (Arthur Thomson), Paul Barnett (alias John Grant), Colin Fine, David Garnett, Tom Holt, Nick Lowe, Peter Nicholls, Patrick Parrinder, Terry Pratchett, Chris Priest, Geoff Ryman, Bob Shaw, Sue Thomason, Ian Watson, Margaret Welbank and D. West. Many more appear in “The Timeless Letter Column”. One section, “Three (And a Bit) Views of Milford”, was cut for space reasons from the print edition and restored for this ebook.